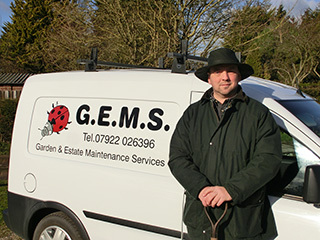 GEMS is a Cambridge based company specialising in the maintenance of gardens and grounds for domestic, residential and commercial clients. GEMS clients range from private individuals who need their unruly garden tidying and tended on a regular basis to Cambridge University and local research institutions with large sites that need to be kept in permanent good order. Clients also include residents associations for blocks of flats and apartments and industrial estates with multiple tenants where the gardens are kept tidy & trim and the hard surfaces swept clean. Hello, I'm Richard Senior, head gardener at GEMS. My family has been looking after gardens and grounds in and around Cambridge for over 30 years. At GEMS we pride ourselves in offering a reliable, conscientious and value for money garden maintenance service to all our clients, domestic, residential and commercial. Based in Cambridge we offer our services to city residents and those in the surrounding area. At GEMS we understand the importance of your outside space and how it affects the people who live and work near it. Our personal approach ensures we work effectively and efficiently to achieve your goals. Whether you are looking for a one off grass cut for your lawn, a scheduled visit contract to keep your commercial grounds tidy or something in between, we have a solution for you. Whatever your garden or estate maintenance requirements please give us a call to discuss. Start the new season off with a regular maintenance contract from GEMS; let us keep your garden in tip top condition for the next 12 months and receive 10% off our usual price. GEMS has maintained our gardens to a beautiful standard, helping us to present a professional image to our highly valued clients. I am very pleased that the garden still looks good after three months. You worked hard and efficiently to do a thorough job and I appreciate how well you understood what I was trying to achieve. From having an overgrown and poorly maintained garden, GEMS came and transformed it into a beautiful oasis. The work was carried out so efficiently and the garden was left extremely tidy.